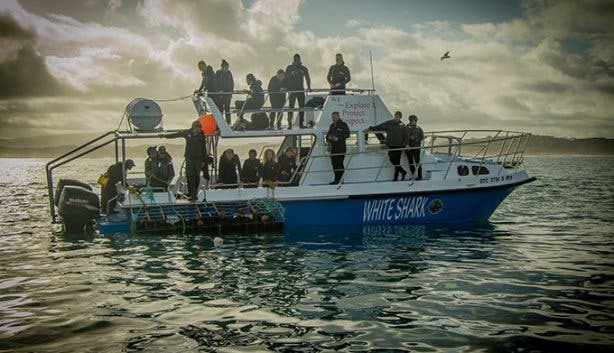 Are you off to embark on an once-in-a-lifetime great white shark cage diving experience with White Shark Diving Company (WSDC) in Gansbaai? 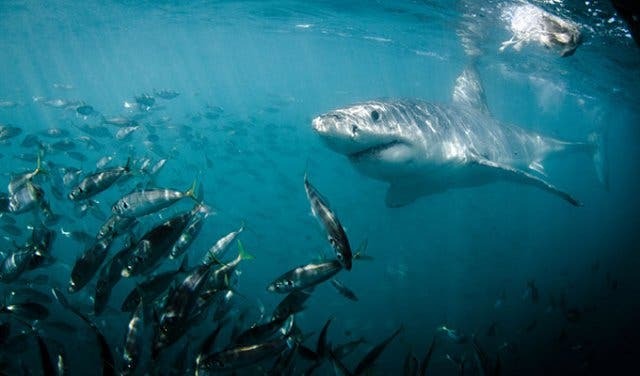 Before you go, buff up on your knowledge about these phenomenal fish, and prepare yourself to enjoy your shark cage diving tour in South Africa as much as possible. 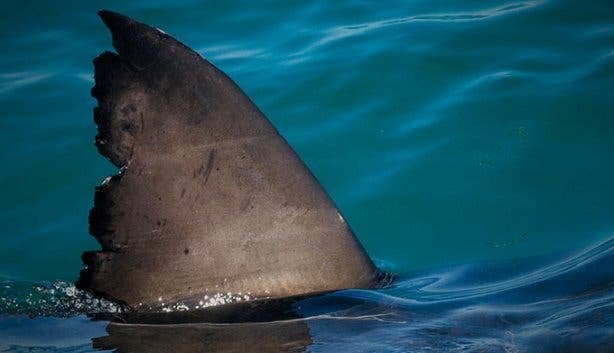 From A-Z, these facts about South African great white sharks and shark cage diving will tell you all you want – and don’t want – to know about one of the greatest, and most unique and misunderstood, marine species on earth. Ampullae of Lorenzini: There are minute pores positioned around the snout and eyes of a great white shark (and ray) that contain a gel sensitive to magnetic and electrical fields. These senses enable them to detect the electromagnetic field emitted by the movement of living animals. Recent research has shown that great white sharks are repelled by the presence of strong magnets based on the presence of this sixth sense. 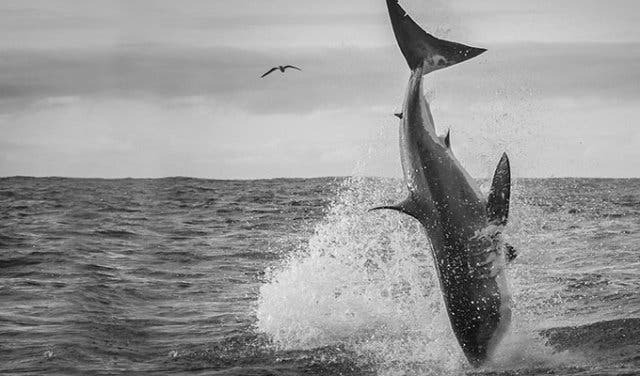 Breaching: Great white sharks breach when hunting swift prey such as seals. By swimming close to the surface, they can reach speeds of up to 65 kilometres per hour and can propel themselves three metres into the air. 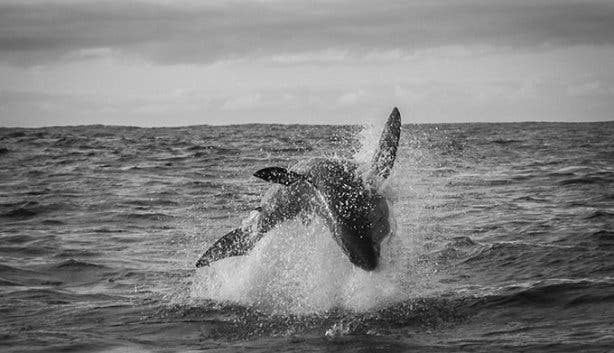 To see a shark breach is a fairly rare occurrence and is generally only seen at particular times of the day and in certain conditions. Carcharodon carcharias is the Latin name for the great white shark. More commonly, these fish are referred to as ‘the great whites’, ‘white sharks’ or ‘the white death’. 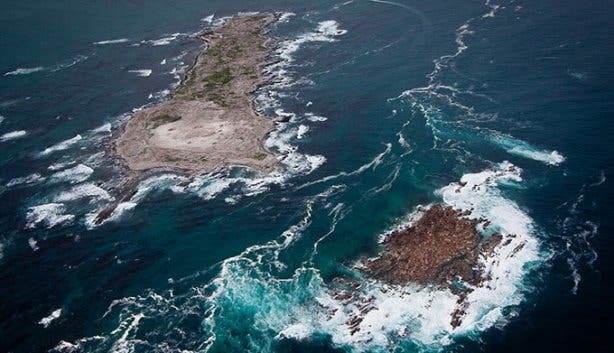 Dyer Island – which is situated five nautical miles off the coast of Gansbaai (a roughly 15-minute boat ride away) – is home to one of the densest known great white shark populations in South Africa (and even the world) and is a site where a lot of shark research and viewing is conducted. Running between Dyer Island and neighbouring Geyser Rock there is a channel of ocean that has been appropriately dubbed ‘Shark Alley’ (owing to the frequency of great white shark traffic). This area is considered one of the best places on earth to study great white shark behaviour. Expenses: Shark cage diving and viewing with the WSDC costs R1 750 to R2 050 for adults and R1 350 for children under 12. A shark breaching and diving combo trip will cost divers R2 950pp. Feeding: Great white sharks are surface feeders and thus all its feeding-activity takes place on or very close to the top of the water. Cape Fur Seals are a South African great white sharks primary source of nutrition. Luckily, there are about 50 – 60 000 living seals in the area of Gansbaai (hence the title of ‘Great White Capital of the World’). Gansbaai: Just 170-km from the City of Cape Town (a roughly two hour drive) in the Overberg region sits Gansbaai, which can be loosely translated to ‘Goose Bay’. The little coastal village is one of South Africa’s much enjoyed touristic highlights as it is best-known for its prime shark researching, viewing and cage diving opportunities. Humans are most definitely not the preferred prey of the great white shark: ‘we’re not tasty enough’. Scientists believe that people may pose more of a threat to great white sharks than the sharks pose to people. ID: The dorsal fin of each great white shark is unique and can be used as a way to identify individuals. ‘Jaws’ was American-writer Peter Benchley's best-selling novel in 1974; the subsequent 1975 film adaptation directed by Steven Spielberg made the public view the great white shark undeservedly as a 'man eater'. Killer? Despite some people’s opinions, great white sharks are not seen as merciless killers. If anything, they are cautious predators. Long-line poaching (commercial) for jaws, teeth and fins forms one of the greatest threats for sharks and could ultimately be responsible for their possible extinction. South African great white sharks are also being killed at an alarming rate due to the demand for shark fin soup in the East. Other major factors include shark nets/’ghost’ nets, drumlines, bycatch, and loss of food due to overfishing as well as environmental changes. 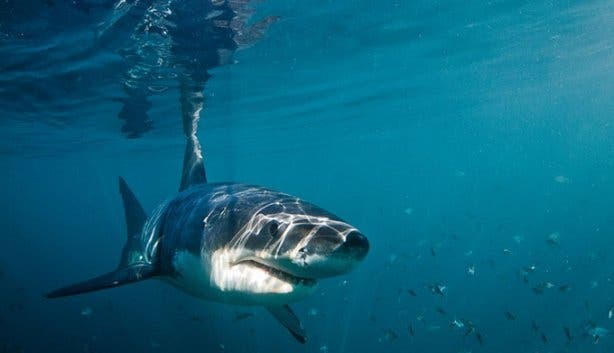 A five-year study – which was spearheaded by the University of Stellenbosch and carried out between 2009 and 2014 – recently revealed that only between 353 and 522 great white sharks still exist along the South African coastline. The extinction of great white sharks could have a disastrous effect on the greater marine ecosystem. Mating: Researchers are still largely in the dark when it comes to great white shark courtship, coupling and reproduction. What is known is that to reproduce, a great white shark needs to be at least four to five metres long and do so with eggs. Most large sharks, such as great white sharks and the whale shark, are ovoviviparous, meaning they incubate and hatch their eggs in the womb and only give birth after the young have developed enough, usually around one metre long, to survive on their own. None Found in Captivity: Great white sharks refuse to live in captivity. Many aquariums around the world have tried but nowhere is the great white shark on display. In captivity great whites sharks are known to become very stressed, even if everything is going right. Great white sharks – unlike many other shark species that are kept in captivity – are not used to hanging around in one spot for long periods of time as they prefer swimming large distances. When a great white shark is placed in a tank – even a large one – the sharks are known to constantly swim into the glass until something – either injury or stress – kills them. 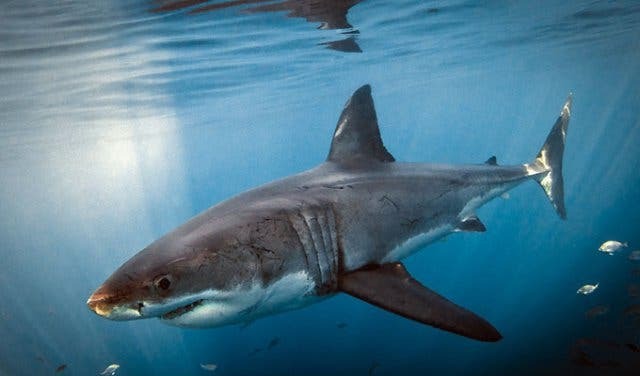 Ocean: Great white sharks are found in almost all coastal and offshore waters in all major oceans, especially those bodies of water surrounding South Africa and Australia. Protecting Endangered Sharks: WSDC is fully committed to the preservation of great white sharks and our marine environment as a whole. This is reflected in its various conservation and social responsibility initiatives and its involvement in facilitating and funding several ocean conservation enterprises. 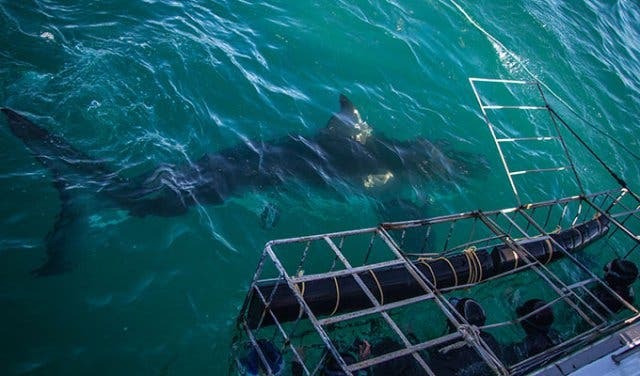 WSDC supports on-going research into and monitoring of the South African shark population, which is spearheaded by a shark research group affiliated to the University of Stellenbosch. 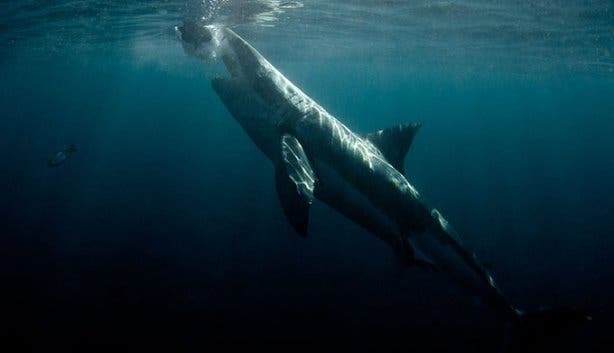 Questionable: Despite years of research, we actually know very little about great white sharks and one of the most phenomenal aspects of these formidable creatures is their ability to remain elusive and unpredictable. 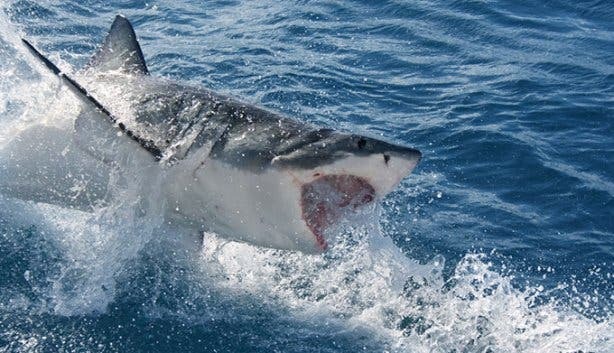 A lot of information – how long they live, how many months they gestate, when they reach maturity and so forth – revolving around great white sharks is still subject to debate because reports are often based on rough estimations or speculations. Research has shown that great white sharks avoid going through any space slimmer than the width of their pectoral fin. Such areas include kelp forests. Sharksafe Barrier: WSDCis involved in the innovative new technology to promote beachgoer safety without costing the lives of marine creatures. The Sharksafe Barrier is an eco-friendly and non-lethal alternative to shark nets and drumlines that uses strong magnets (see A) and the notion of a kelp forest (see R) creating an artificial kelp-like barrier that keeps great white sharks at bay. The Team: WSDC’s crew members are specialists in shark behaviour and have full safety authority credentials. 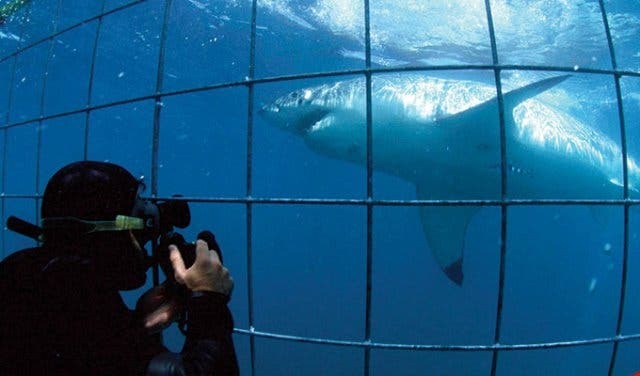 Unique Experience: Shark cage diving in South Africa is on the ‘Top 10’ of virtually all South African travel guides. 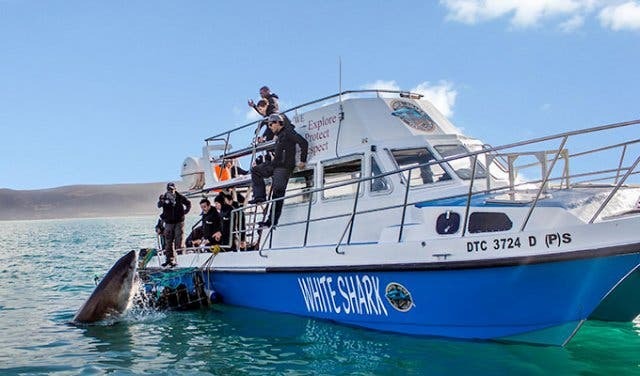 In an attempt to create exclusivity and to ensure each diver has more dive time and thus a better personal experience with the great white sharks, WSDC allows a maximum of 22 passengers on board its boat and a maximum of eight divers in the floating cage. Volunteer Programme: WSDC’s Volunteer Programme offers volunteers the chance to become involved in ground breaking research whilst studying great white shark populations and their behaviour, shark and ray diversity and abundant fish biology, marine debris accumulation and ocean conservation. Assistant researchers will also receive first-hand experience on board WSDC’s tourist boat, play a vital role in data collections and management as well as have ample cage diving time. WSDC is the winner of the TripAdvisor Certificate of Excellence for 2014, 2015 and 2016. X-tra Speedy: Sharks are poikilotherms, meaning they are ‘cold-blooded’ animals whose internal body temperature varies widely. Great white sharks, however, are very unique in the sense that they are also heterothermic, which means that they maintain an internal body temperature that is around five to 15 degrees warmer than the surrounding water. The warmer temperature enables the muscles to contract more quickly, giving the great white shark the ability to swim faster. Recording sensors suggest that the sharks swim at an average speed of 7kph and can reach maximum seeds of 30kph. Years: The great white shark is probably one of the oldest species that we can still see in the ocean today. Earliest ancestors of great white sharks were around 400 million years ago, but they probably arrived around 60 – 100 million years ago. Zero Accidents: WSDC has been operatingfor 20 years with a 100% safety record. WSDC takes pride in operating in a responsible and safe manner where their staff and crew members are well-trained individuals and their facilities are constantly upgraded to ensure continued growth through customer satisfaction. Now that you know all the necessary sharky-facts, book a shark cage diving or shark breaching experience with WSDC, which specialises in underwater adventures that showcase the kings of the big blue in their natural habitat. Taking place in Gansbaai, which is located approximately two-hours from Cape Town and is notorious for its year-round (although May to September are prime viewing months) great white shark population, brave and daring clients can choose to either meet the reputable operator at Kleinbaai harbour or arrange to be picked up in the Mother City (at an extra cost). The day tours are known to start early in the morning – as this is the best time to meet the marine masters – and guests are taken by boat (a 12-metre long sea-cabin cruiser catamaran seating maximum 22 passengers) to Dyer Island, a roughly 15 minute boat cruise. Thanks to the thousands (upon thousands) of Cape Fur Seals that live and breed on the nearby island, divers are almost always guaranteed to spot the impressive fish from the safety of the submerged steel eight-man floating-cage. 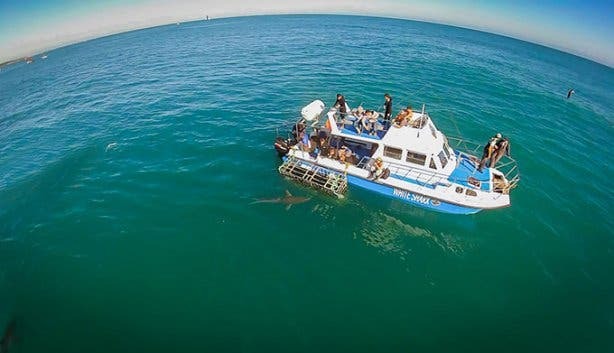 Offering shark cage diving trips, shark breaching tours, as well as viewing-only excursions, everyone on board – no matter if they are in the water or not – is guaranteed a quality shark-viewing experience they will never forget! 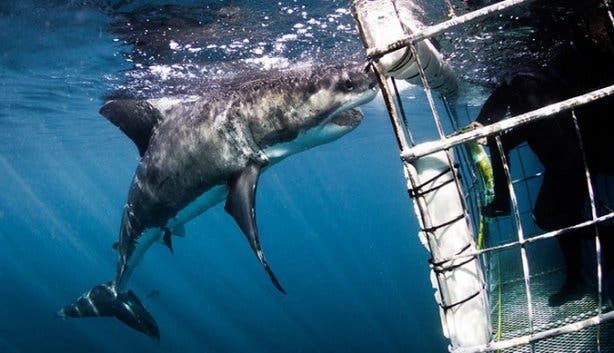 Read more about encountering the Atlantic’s most ferocious fish in the great white shark capital of the world in our article Great White Shark Cage Diving in Gansbaai with White Shark Diving Company. You can also read more here about White Shark Diving Company’s Breaching Tours.